So you put the work in and figured out what you want in life. You have a big Vision and a Plan. You are barrelling along making your dream life / job / relationship happen when, wham, all of a sudden, obstacle. Sometimes we meet small obstacles or changes in our world which require adjustment to the plan. Sometimes it’s seismic and requires chucking the whole Vision out and starting from scratch. This does not mean you have failed – even if it appears to you to be failure – you haven’t. It just means that what you were doing is not working or that circumstances have changed so it can’t work. Or, equally valid, you changed your mind about what you really want. Something better might have come up, or you realised it wasn’t your dream after all it was somebody else’s. You can choose to view this point in proceedings as a disaster, failure or end of the dream. And in fact it’s ok to view it as such for a while, nothing wrong with a good cry and allowing your feelings to be what they are. Just don’t get stuck there. It’s all part of the trip. Change, upset, obstacles – they are all just pit stops. Same as success, achievement and fun, everything changes and moves on. 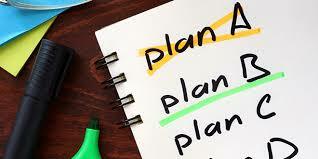 When you have had the good cry and are ready, get your creative boots on and make a new plan. With ME/CFS, my plans got interrupted (the seismic version in my opinion!) This has radically changed my short and medium term Vision and plans. The Vision is now health and the plan is all the actions that will support that Vision. The awful thing in this situation is that no one can give me a prognosis. However that’s also the great thing. I am free to choose to believe I will get better. So my long term Visions for my work are still possible. That means I don’t have to ditch the big shiny dreams, I can hold them and take tiny steps towards them when I’m able. It’s just the deadline is pushed out a few years. And that’s Ok. If my health or other circumstances change dramatically again, I’ll change the Vision and plan again. If I have to chuck it all out and start again, I will. No problem, just life. « Previous Post: Una’s little world 7. Is this a disaster or an opportunity?